Few chain restaurants are part of Winterlicious, except for Canyon Creek who has regularly made the roster. I can see why, it’s hard to argue with value - their lunch menu is a steal at $18 (refer to the end of the post for calculated savings). Plus, their “upscale casual” menu is approachable while still interesting, although mains such as pho and bibimbap seem out of place at an establishment that use to label itself as a chop house. 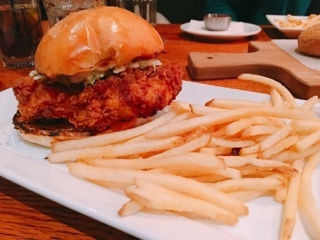 Hence, the Southern fried chicken sandwich seemed like a safer choice at Canyon Creek. Even though the breaded chicken breast was tender and moist, despite being a thick piece, something was missing. Perhaps it’s the promised buttermilk jicama slaw that should in the sandwich – shouldn’t I taste a lovely refreshing crunch? Why did it seem like someone simply slathered guacamole on instead, which in itself isn’t terrible, just tired and disappointing. Or it could be the sandwich lacked a spicy kick from the chipotle mayo or jalapeño that’s listed as ingredients. In the end, it’s good for a “Southern fried chicken sandwich”, but weak for a “Southern fried chicken sandwich with jicama slaw, chipotle mayo and jalapeño”. 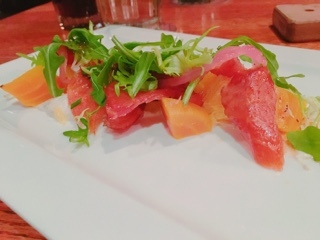 On the other hand, the candied Atlantic salmon appetizer surpassed expectations. At first, hearing there were golden beets and “candy” in the dish, I was apprehensive whether it’d would become overly sweet. Luckily, the sugariness was counteracted with sour elements (pickled onions and crème fraiche), using smoked salmon that gave a savoury quality to the dish, and incorporating horseradish for an unexpected zesty hit. 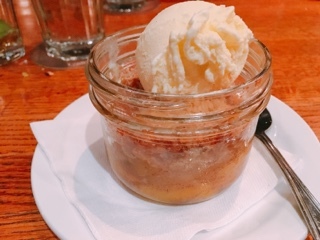 The peach crumble is everything you’d expected from the classic dessert: warm so it was comforting, the cinnamon sugar streusel topping, and a scoop of cold vanilla ice cream that melts into the peaches creating a caramel cream sauce. It’s a satisfying dessert, canned peaches notwithstanding. It’s a shame that taking an hour and a half break for lunch isn’t easier on a weekday, as the Winterlicious choices offer amazing savings. You’ll leave full and satisfied … and in desperate need for an afternoon nap. Is Winterlicious worth it (based on my meal selection)?